Ever since I got my first kayak, I have been discovering new ways for its use to enhance my outdoor experience. For example, I found out that some people actually paddle without fishing. You can actually just go out and enjoy the world around you without fishing. I have tried this strange hobby and it is really fun. However, the best of my new found pleasures is extending my fishing time by camping. Now keep in mind the kind of camping I am talking about here is not some grueling 10 day paddle through the Everglades (although that would be a blast). Rather, this for a person who is going to a single destination and spending one or two nights. Many of the concepts discussed here would not be applicable to someone wanting to do an extended trip. This is simply a way to get out and enjoy our marvelous state for just a little bit longer. You can enjoy the camping experience in of two ways. The first and easiest way is to experience one of our fabulous state or national parks. It would be practically impossible in a short article to list all of the parks that are also great paddling/fishing destinations. This method of camping also allows you to carry a few more of the amenities that make for the “good life.” On the down side, the park systems will restrict what you can or cannot do. Many parks do not allow open fires, for example. What good is camping without a fire? I prefer more primitive camping. I want to load up the boat and get away from it all. Also a primitive camping trip allows for more of a challenge. The challenges are not all that insurmountable. I just find that the extra effort makes for a more rewarding experience. The biggest drawback to this style of camping is finding locations. Destinations for the primitive camping experience are becoming harder to find. In addition, there is a growing popularity for this style of camping which creates competition for the limited space. For me, there aren’t many things better than paddling out in the afternoon to an island for an extended fishing session. You can set up your campsite, relax for a while, and then do a little late day fishing. After that you can spend an enjoyable evening at the campsite. Or, if you prefer, you can even do a little night fishing. If you camp on one of the barrier islands you can spend the evening working the beaches. When you get up the next morning, you are already at your fishing destination ready for a morning of angling. Another advantage of a 1 or 2 day trip, is the relationships you will form with your camping friends. While camping solo is rewarding and enjoyable in its own right, nothing beats the community that forms at a campsite. You can learn much about yourself and other people. Friendships are made and/or reinforced. I love to watch how different people act and react while camping. Some are always busy: fiddling with equipment, cooking, or tending a fire. Many of us just like to kick back and relax. There are the readers. They always bring a book to enjoy. The possibilities for enjoying the camping experience are unlimited. They way people enjoy it is a reflection of their personalities. A camping/fishing trip is not always about the fishing. This is the nature of the beast. The weather may turn inclement. To me this is a bonus. Even if the fishing is bad, you might still have a great camping trip. In fact, I usually end up fishing less when camping than I normally do. Before I had started on this new adventure, I had not camped in over 20 years. It is amazing how much the equipment has improved in that time. Gear is lighter, more durable, and easier to use. As an added bonus, you can get quality products at a reasonable price. To be sure, you can still spend the big dollars and buy high end items. One of the advantages of camping in Florida is our weather. Unless you choose to go camping in January just as a cold front comes through, you will not need gear for extreme weather conditions. A three season tent will do just fine. You do not need a zero degree sleeping bag or any other costly equipment. 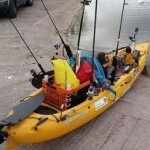 Kayaks can store an amazing amount of equipment. Canoes will hold even more. Either craft will easily store what the paddle camper needs for a one or two night stay “in the wild.” At this point comes the first question you need to ask yourself. How much equipment do I need to take? I tend to take the minimum amount of equipment to maintain my safety and comfort. At the other end of the range are those campers who carry the maximum amount of equipment. They load every nook and cranny of their boat with camping equipment, provisions, and luxury items. I have even seen them tow a second boat just to carry more gear. Those who carry the minimum amount have less weight to carry around. They also have less to clean up and carry back. Those who go the other route have more creature comforts to make their trip enjoyable. But they have to deal with the weight and maintenance issues involved with more gear. I suspect that if you start camping, you’ll fall somewhere in between the two extremes. Look at it this way: Paddle your kayak with absolutely nothing in it. Now add your fishing gear. Paddle it now. You will notice some minor changes in the way the kayak handles. Not much. Most of us don’t carry more than 20 pounds or so of fishing gear (and that would include your anchor). For those of us on the portly side, that’s less than a 10 percent increase. Now add 40 pounds of camping gear and paddle the boat again. You’ll start seeing a definite change (for the worse) in the handling characteristics of a boat. Another factor in that might help you decide in what and how much to take is the impact that you will have on the environment. Remember, what ever you take into the campsite you SHOULD take out. Most of us are sensitive to these issues. The prevailing philosophy is “to leave no trace.” The more you take, the harder it is to follow this rule. Part II — What Does A Minimalist Take? Kayak Fishing: Keep It Simple!